While you are all super busy trying to answer this week’s Mystery Coach to win a free membership, we wanted to share some info on a legendary NFL coach for the ages. 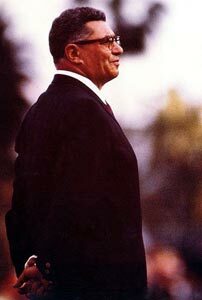 Vince Lombardi was one of greatest coaches to ever coach the game of football. Born in Brooklyn, New York – Lombardi went on to win the first two Super Bowls with the Green Bay Packers! He was inducted into the Hall of Fame in 1971 and even had the Super Bowl Trophy named after him! And he never did. Years later he started his NFL coaching career with the New York Giants before moving on to the Packers in 1958. The Packers team he inherited had 5 future Hall of Famers on the squad! By the time his career was over, he was pretty much the face of the NFL and will always be a household name for the sport. In the 1960’s during a time of civil unrest, Lombardi would allow no racial tension between his players and their unity is what made them such a great team. Truly a great coach! Posted by fungoplay on September 16, 2011 in Flashback Friday and tagged flashback friday, football, NFL, superbowl, vince lombardi.